Obtaining the Cattle of Geryon was the tenth task allocated to Heracles by King Eurystheus. The cattle were magnificent beasts, with coats made red by the red-light of the sunset; the danger in the task though, was the fact that the cattle were owned by Geryon, a triple bodied giant, a giant described as the strongest of all mortals by Hesiod. The story of the stealing of the Cattle of Geryon was an early myth, with written reference as far back as Hesiod, but it was also a story embellished greatly over the years, and right through until the late Roman period amendments to the story were being made. Heracles returned to the court of King Eurystheus with the Belt (Girdle) of Hippolyta that Eurystheus’ daughter Admete had so desired. With no thought of rest though, the herald Copreus was sent to tell Heracles that now he must obtain the Cattle of Geryon. The cattle of Geryon grazed upon the grasses of Erytheia; Erytheia being an island at the western most edge of the known world. Erytheia was the island of the Hesperides, the island where, each evening, the sunset. It was the sun setting that caused the coats of the cattle of Geryon to be stained a distinctive red. These cattle were owned by Geryon, a son of Chrysaor and Callirhoe, and therefore grandson of Medusa. Geryon was an armoured giant, commonly said to resemble three separate men, joined at the waist; Geryon was said to have had immense strength, and had overcome all who had faced him. With Labour set, Heracles would set out on a long journey, and to get the furthest most point of the Western Mediterranean, Heracles would travel through Egypt and Libya. Many tales were added about the journey to and from Erytheia; and in some versions of the tale it was on this journey that Heracles killed Busiris and Antaeus. Busiris was a cruel king of Egypt to sacrifice strangers found in his realm. 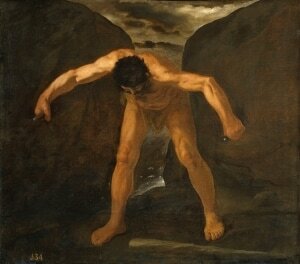 When Heracles was found crossing Egypt, the hero was captured and tide up. Before Heracles could be sacrificed though, the demi-god broke his chains, and killed Busiris. Antaeus was a giant, a son of Gaia, who challenged all passers-by to a wrestling bout, all opponents would die in his hands, and the skulls of the vanquished were placed into the roof of a temple dedicated to Poseidon. Heracles was himself challenged by Anteus, but the hero was aided by Athena, who advised Heracles to lift him from the earth, so that he could not gain strength from it. This Heracles did, and whilst aloft, Heracles crushed the ribcage of Anteus, killing the giant. 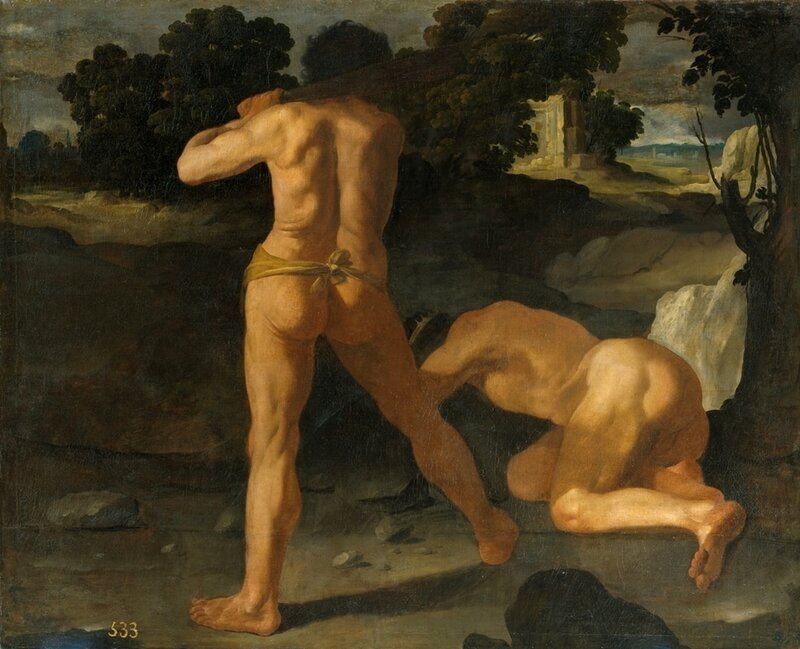 Both the killing of Antaeus and of Busiris are more often said to have occurred in different adventures of Heracles, including the Eleventh Labour, collecting the Golden Apples. There is a brief mention of Heracles founding Hecatompolis during his journey, but there is not a great deal of clarity as to where Hecatompolis was. The name itself means a “hundred cities (polis)”, which is sometimes used in reference to Laconia, and also sometimes to a place in Egypt. When Heracles reached the most western point of his journey, he celebrated the event by creating the Pillars of Hercules. ​In the Bibliotheca, Heracles created the two mountains, Mons Calpe and Mons Abyla, by building them. In other versions of the myth, Heracles split in half an existing mountain, creating the Strait of Gibraltar at the same time. As Heracles crossed Libya, the heat of the sun greatly upset him, and in a fit of anger, Heracles took up his bow and started firing arrows at the sun. Some say of how Helios was pleased with the brashness of Heracles that he presented him with his own golden boat to help the hero finish his journey to Erytheia. This was the golden boat on which Helios himself travelled each night upon Oceanus, from west to east. Alternatively, Heracles got so close to injuring Helios that Helios pleaded with Heracles to stop firing arrows at him; in this case Heracles demanded the assistance of the god in return for stopping shooting. The golden boat allowed Heracles to quickly sail to Erytheia, and on the island’s shoreline the hero landed. Heracles quickly set up camp, but even as he did so the presence of Heracles upon the island was noted, for Orthus, the two headed guard dog of the cattle of Geryon smelt his presence. Orthus was the brother of the more famous Cerberus, and the monstrous dog attacked the stranger who had set foot upon his island. As the guard dog approached though, Heracles swung his olive wood club, and killed the dog with a single blow. Soon after, Eurytion, a son of Ares and Erytheia (a Hesperid), who was also the herdsman of Geryon. Eurytion though, was dispatched in the same manner as Orthus. Heracles would round up the cattle of Geryon, and drive them towards his boat. Geryon was soon informed about the theft of his cattle, possibly by Menoites, the herdsman of Hades, for it was said that Hades’ cattle also grazed upon Erytheia. Geryon thus donned his armour and hurried after his rustled cattle. Geryon caught up to Heracles at the River Athemus, but it is commonly said, that rather than test his strength against Geryon, Heracles instead took up his bow, and shot an arrow through one of the heads of Geryon. The poison of the Hydra worked its way through all constituent parts of the giant, and so Geryon fell down dead. Some also say that the goddess Hera had come to Erytheia to aid the giant in his fight, but she too was hit by an arrow, and had to retreat back to Mount Olympus. A few writers do tell of Heracles actually wrestling Geryon, and of course the strength of Heracles outdid that of Geryon, and Heracles thus killed the giant by splitting him into three. With Geryon dead it was a simple matter now of herding the cattle of Geryon onto the golden boat. Later writers in antiquity thought the earlier myths were too fantastical to be true, and thus to explain the myth of Geryon’s cattle, they told of how Geryon was actually the collective name for three sons of Chrysaor. ​Each of these sons was a strong warrior, who led a powerful army, and the three sons would work together. Thus, Heracles himself assembled a strong army and sailed for Iberia. When Heracles landed with his army, he challenged each of the sons of Chrysaor to single combat, and killed each of them in turn, and thus with no commanders there was no war, and so Heracles could drive off the Cattle of Geryon. Later writers would ensure that the return journey of Heracles with the cattle of Geryon was far from easy. It was said that in Liguria two sons of the god Poseidon attempted to steal some of the red coated cattle, but Heracles killed them before they relieved him of any beasts. At the place now known as Reggio di Calabria, one of the cattle managed to escape from the care of Heracles, and as it made its way across the country the land was called after it, for that land was Italy, and its name probably comes from Víteliú, the “land of bulls”. A more common story told about the naming of Italy comes from the fact that Italus was said to be the father of Romulus and Remus. This lost bull was said to have been found by Eryx, the king of Sicily, who placed it amongst his own herd. When Heracles finally located it there, Eryx would not willingly give it up, and so instead, the king challenged Heracles to a wrestling match. Heracles would easily overcome the king, and even killed Eryx in the process, and so once again the cattle of Geryon were back together. The Cattle of Geryon though were much in demand for when Heracles camped for the night upon the Aventine Hill, the fire-breathing giant, Cacus, a son of Hephaestus, emerged from his lair, and stole some cattle, possibly four bulls and four cows, whilst Heracles slept. To cover his tracks, Cacus was said to have either dragged the cattle backwards, or forced them to walk backwards, just as Hermes had done when the god stole cattle in his younger days. Heracles was at a loss as to what had happened to the cattle, but some say how he was told where they were by Cacus’ sister, Caca, or else as Heracles drove the remaining cattle past Cacus’ lair, the two sets of cattle called out to each other. In either case, Heracles now knew where the stolen cattle were, and so killed Cacus. To mark the killing of Cacus, Heracles was said to have constructed an altar, and at that spot, generations later, the Roman cattle market, Forum Boarium, was held. Onwards Heracles travelled but still his trials and tribulations with the Cattle of Geryon were not complete for as Heracles travelled through Thrace, Hera sent forth a gadfly, which stung the cattle, causing them to bolt in all directions. As Heracles went after the loose cattle, Hera then induced the Potamoi Strymon to make its river impassable. Heracles though would pile rock after rock into the river, allowing him to cross, and also making the river unnavigable in the future. Eventually, Heracles did return to the court of King Eurystheus driving the Cattle of Geryon before him. Once again Eurystheus was disappointed by the fact that Heracles had not died in the attempting the task, and taking the cattle from the hero, Eurystheus would sacrifice all of the herd to his benefactor, Hera.